White House Counsel Don McGahn left the Trump administration on Wednesday, White House officials said, the latest in a string of high-profile departures. McGahn's departure comes a day after President Donald Trump told The Associated Press in a Tuesday interview that Washington lawyer Pat Cipollone to serve as his next White House counsel. McGahn was tapped by then president-elect Donald Trump during the transition in November of 2016. In August, Trump said on Twitter that McGahn would be leaving his post in the fall after the confirmation of Brett Kavanaugh to the Supreme Court, which occurred earlier this month. McGahn was not aware that the president would be tweeting about his future but was not upset by it, according to an administration official at the time. The announcement by Trump about McGahn's planned departure came less than two weeks after The New York Times reported that McGahn had spent 30 hours talking with the special counsel Robert Mueller's team, which is investigating Russian interference with the 2016 presidential election and other matters. At the time, the newspaper reported that McGahn "provided the investigators examining whether Mr. Trump obstructed justice a clear view of the president's most intimate moments with his lawyer." 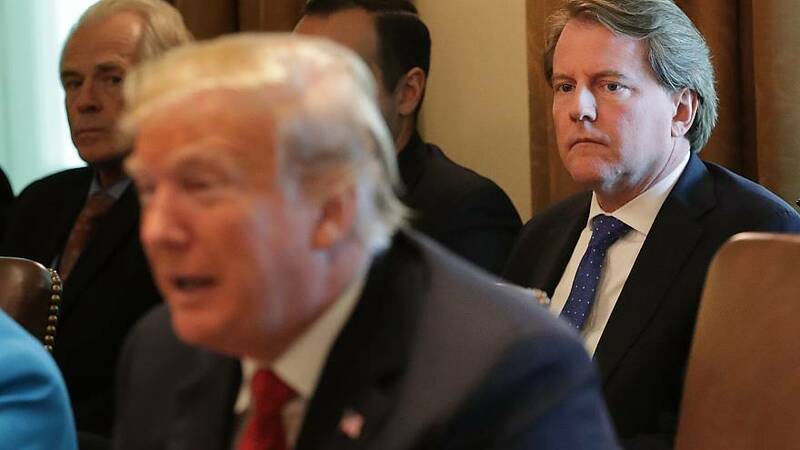 McGahn is a former member of the Federal Election Commission who was one of Trump's longest-serving aides, having joined Trump's 2016 presidential campaign as counsel. When it was revealed that McGahn had cooperated with Mueller's probe, Trump tweeted that he allowed McGahn and other requested members of the White House staff to cooperate fully with the special counsel. McGahn reportedly threatened to quit his post in 2017 after Trump ordered Mueller to be fired in June of that year, according to The New York Times. According to the report, Trump backed down after McGahn threatened to resign. Last week, Trump's ambassador to the United Nations, Nikki Haley, announced her resignation. That announcement reportedly caught administration officials off guard. Haley, former governor of South Carolina, is to leave the administration at the end of the year, she and Trump announced.